Apple's iPod Shuffle: the next great appetizer? 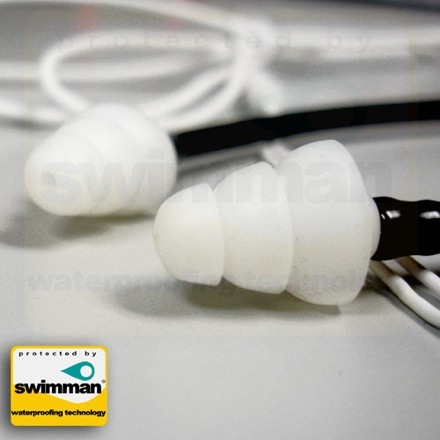 Look, a waterproof iPod shuffle! Yes there, pictured to the right. Where's the big bulky case, you ask? Ain't none... the waterproofing is on the inside this time kids. 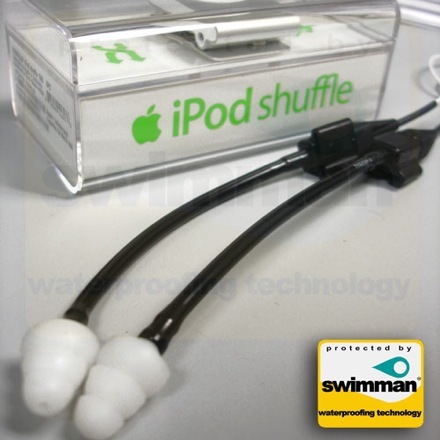 That's right, SWIMMAN has turned an honest-to-goodness second generation iPod shuffle into a "100% waterproof" player capable of operation in waters up to 10 feet deep. You can't scuba with it, but it'll clip onto the back of your googles just fine if you're a swimmer. Hell you can even wear it the shower... assuming you can find something to, uh, clip it to. 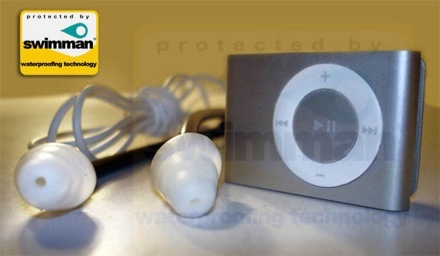 Now the price: $150 for just the waterproofed iPod shuffle or $250 for the shuffle with a waterproof headset and a 1-year limited warranty... 'cause you know Apple won't cover it. More pics including the orthopedic headphones after the break.